In the past, I have written about Bounce Rates, Traffic Source Bounce Rates and Segment Bounce Rates. Hopefully this will be my last post related to Bounce Rates, but I recently found a “hack” to calculate and trend a Site Wide Bounce Rate in SiteCatalyst so I thought I would share it. I define Site Wide Bounce Rate as the total number of Single Access Visits divided by the total number of website Visits. Unfortunately, for some reason, this metric is very difficult to wrestle down in Omniture SiteCatalyst because you cannot view Pathing metrics (i.e. Entries, Single Access) in Calculated Metrics unless you are within an Traffic (sProp) report that has Pathing enabled. 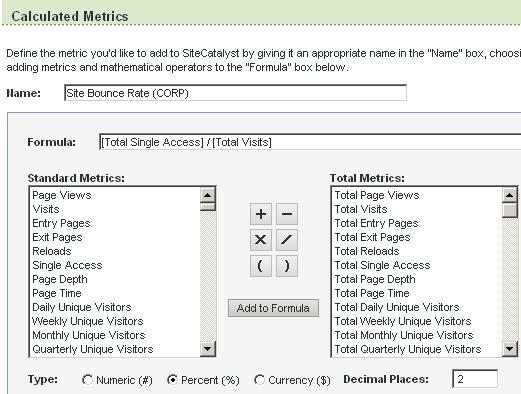 To date, the way I have reported on Site Wide Bounce Rate was by pulling Visits and Single Access data into Excel using the SiteCatalyst ExcelClient. Once there, I could divide the two and if I wanted to see it by day (or week or month), all I needed to do was to pull both metrics by day. It was straightforward, but I could not add this to my SiteCatalyst Dashboards. When you click OK, you will be able to see a report that shows your most popular pages, the Bounce Rate for each page and the overall Site Wide Bounce Rate. This report is handy for seeing how each page is doing in relation to the Site Wide Bounce Rate. 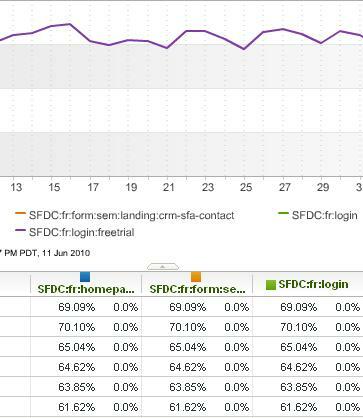 So the resulting graph is your Site Wide Bounce Rate and you can now add this to any SiteCatalyst Dashboard. However, as you recall, I mentioned this is a “hack” so if you look closely you will see a bunch of pages in the data table for this report. What is strange is that the values for each row are the exact same. This is the place where you can see how much of a hack this is. This data is pretty much useless so I recommend just adding the graph to your dashboards and ignoring the data table. Perhaps in the future Omniture will let us add this type of Calculated Metric to the “My Calc Metrics” area so we don’t have to take such a convoluted path to add this trend graph to a dashboard! So there you have it. A quick hack in case you ever need to calculate Site Wide Bounce Rate for your HIPPO’s! Enjoy! Hi Adam, would it not be better to have Entries as the denominator? This would be more for the pages level I’d imagine. Or is the Total Visits for a page the same as the total entries to it as well? This is brilliant. Thank you Adam. That’s a nice hack, but mine is ever simpler. If you go to the Path-Length report (assuming your report suite has pathing enabled) and see the percent for the “Visits of 1 Page,” it’s usually close to, if not an exact match, to the site-wide bounce rate. I’ve tested this across several sites I’ve worked on and I’ve never seen it be more than 1% point different from the calculated site-wide bounce. If I have to report this to the HiPPOs, I prefer to waste as little time as possible on it! That is awesome! I had never seen that or tried that. I just did a test and saw that the numbers were the same as well. Your method is a lot quicker so thanks for sharing! Hi Adam, that would make sense for the overall site but not sure how it would work at the page level. Mainly because the number of entries to a page is more likely to be lower than the number of visits to it. I used Gabi’s method. Thanks for the helpful tip here, guys. I’ve wondered how to get this metric before, because one of my internal clients asked for it. But while this is good to know and trend, an aggregate site wide bounce rate has little meaning particularly to my business. Some pages naturally have a high bounce rate, such as the confirmation page of an order. As for other pages, we want the bounce rate to be as low as possible, like the homepage. This number can easily skew by one or two pages if you have a big site. When one get an aggregate number of everything, I don’t know what I can get out of this metric anymore, it doesn’t tell me much. I explained this to my client, and she realized it, and I think what she really wants to know is the homepage only. What is the purpose of knowing site bounce rate? I mean it isn’t very actionable. if you are talking about landing page bounce rate, or homepage bounce rate, then I can understand where to improve. But overall bounce rate just seem like a vague metric. Yes I back Gabi’s solution. We’ve been using the Path Length report for close to 2 years and ours is the same compared to the calculated metrics version. Very quick and easy!